Readers, this is Ben Douglas’ next exposition of Eli Soriano. Part Three.Hope you are enjoying these series and are learning more about this destructive man made cult and their Notorious leader?Feel free to give us feedback. Soriano’s interpretation here misses the mark completely. All St. Paul is saying that once his audience has sufficiently mastered the basics of the Christian religion, it will be possible for his discourse to advance to more lofty themes. Analogously, a math teacher might tell his students that once they have mastered arithmetic they can move on to algebra. St. Paul is absolutely not telling his audience that they ought to forget or abandon the “fundamental doctrines of Christ.” These are the foundation of Christianity; they support the entire soaring edifice, and without them the religion has nothing on which to stand. The foundation can never be forgotten. St. Paul’s only point is that once it has been laid properly once, the Christian teacher can move on from teaching these subjects and start building upon them the superstructure of more advanced theology. To risk mixing metaphors, once the new Christian has been nursed to a certain degree of maturity on spiritual milk, the teacher can then begin to give him solid food (Heb 5:12-14). It would be silly to keep “laying the foundation” over and over again, by teaching nothing but the basics, and never graduating Christian students from ecclesiastical kindergarten, just like it would be silly to hold back school children in the same grade year after year. Once we learn how to read, write, and do basic math, we can move on to history, philosophy, engineering, etc. But that does not mean we can forget about reading, writing, and basic math, or the more advanced subjects will become impossible. So too, should a Christian forget about repentance, faith, baptism, the laying of hands, and the resurrection of the dead, he will turn his religion into nonsense. There are many more errors in Soriano’s “book.” As a side note, for one who blasts the Catholic Church for using a little bit of Latin in her liturgy, he has no problem with using the Latin phrase prima facie himself in the very first paragraph. Don’t you see, Mr. Soriano, that learning the meaning of a few words of Latin, whether prima facie or dominus vobiscum is really not that hard? A little while later, Soriano makes yet another exegetical blunder when he states that the primary purpose of the laying of hands is “to heal the physical or material body of the subject person”23 (this is allegedly why we ought to “leave behind” this fundamental doctrine; Jesus wants us to forget about temporal things like bodily health and move on to the spiritual realm). One wonders if he is reading the same Bible as the rest of us. Scripture frequently records that the Apostles laid their hands on persons in perfect bodily health, in order to confer a spiritual gift. “The Spirit was bestowed through the laying on of the apostles’ hands” (Acts 8:17; cf. 19:6). St. Paul likewise urges St. Timothy to kindle afresh the charisma, the spiritual, supernatural gift which he received through the laying of hands (2 Timothy 1:6). That gift was his ordination to the episcopacy. The Apostles, through the laying of hands, also ordained St. Stephen and six other men to the diaconate (Acts 6:5-6). So, one sees that in Scripture the laying of hands is ordered primarily to supernatural and spiritual realities, not mere bodily health as Soriano says. And the Catholic Church is ever faithful to the Bible. In fact, the phrase “the laying of hands” is simply the biblical manner of denoting the Catholic sacraments of Confirmation and Holy Orders. Next, leaving behind Leaving Behind the Fundamental Doctrines of Christ, let us go on to Soriano’s sermons, not sparing them from critical scrutiny, but likewise demonstrating their bankruptcy and internal contradiction. 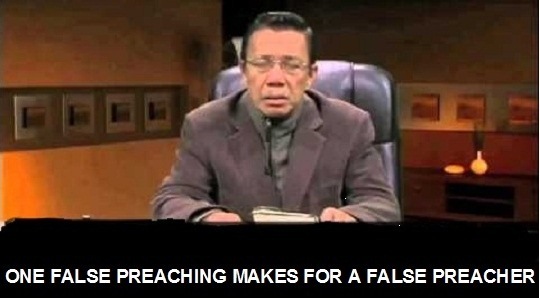 Let’s start with his sermon on “the salvation which is being taught by the Bible”, in which he chastises his ecclesiastical great grandfather, the Iglesia ni Cristo of Mr. Felix Manalo, for teaching that outside of it there is no salvation.24 He is, of course, quite right in decrying this claim as false. However, excepting his provision for the salvation of those who never hear the Gospel, Soriano in effect makes the exact same claim, for while he does reject any form of extra ecclesiam meam nulla salus (outside my church there is no salvation) in theory, this is essentially what his doctrine amounts to in practice. Second, he claims in his sermon on whether it is God’s will that we join a Church that, “Everything that the Apostles saw and heard had been written down.“34 This is just a blatant and explicit contradiction of Scripture. It is written, “But there are also many other things which Jesus did; which, if they were written every one, the world itself, I think, would not be able to contain the books that should be written” (John 21:25). Has Soriano not read this verse? Soriano has completely missed Shakespeare’s point. The point of the phrase “a rose by any other name would smell as sweet” is that a thing, objectively, is what it is. The name one applies to it does not change its intrinsic nature. A rose will still be a rose, and thus will still smell sweet, even if you call it a stinkblossom. Similarly, the Catholic Church will still be the Church founded by Christ, even if you call it awful names like the whore of Babylon, and the holy sacrifice of the Mass will still yield an aroma of spiritual fragrance which is pleasing and acceptable to the Lord even if you call it an abomination. Conversely, as Soriano points out, calling a katuray a rose will not make it sweeter. Calling a stinkblossom a rose will not make it less foul. Thus, no matter whether Soriano calls his church “the Church of the living God, Pillar and Foundation of the Truth,” “Members Church of God International,” or “Ang Dating Daan,” it will never be the pillar and foundation of the truth, it will never be the church of God, and it will never be the same “old path” referenced in Jeremiah 6:16. So, we certainly grant to Soriano, that misnaming things is not good, and that calling evil good and good evil will neither make evil good nor good evil. But that is exactly what Shakespeare is saying in the phrase Soriano rejects. Soriano thus uses an argument which proves that misnaming something does not change its nature, in order to refute a phrase which teaches that misnaming something does not change its nature. At the risk of sounding like a broken record, I will state it again: Soriano is incompetent. He ought to be embarrassed at the utterly foolish things that he has said. Moreover, his followers ought to realize that one who so frequently sticks his foot in his mouth might not be the most reliable guide to the finer points of Christian theology and biblical exegesis, and that it might not be the safest thing to place one’s eternal salvation in his hands. For if he can be so wrong about something so simple as recognizing a metaphor, he can be wrong about something difficult like the nature of God or of salvation as well. Indeed, one would expect his errors to be all the more grievous as the subject of his expositions grows more grave. This is, in fact, the case, as I will demonstrate below. This entry was posted in ADD Members-following a false preacher, ADD-'a fool God and a wise Preacher", ADD-a greedy business empire, Bag of Tricks and deception, Eli Soriano, Eli Soriano-a maw of a false Preacher, Lies and deception, Rebuttals and tagged ADD cult, ADD members-following a false preacher, Ben Douglas, Eli Soriano-a maw of false Preacher. Bookmark the permalink.